"Please send us your pictures..."
We invite you to send us your pictures of any Kinsman item that you enjoy in your garden or home--such as hanging baskets, hayracks, birdhouses, EverEdge, arches, trellises, rose pillars, plant supports and more. This isn't a Contest, but we'd love to share your photos with other gardeners. 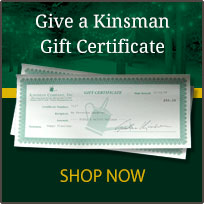 When we do use one of your pictures, we'll say "Thank You" by sending you a $100 Kinsman Gift Certificate. Email us your photos of any Kinsman Company product that you use to photo@kinsmangarden.com. Please include your contact information and a brief description of how you have planted or used the product. July 31, 2019, is the deadline for inclusion in our 2019 Fall Gift and 2020 Spring Catalogs.